Tiny houses—be they Brutalist or just twee—are seen by some as a lifestyle option for Pinterest de-clutterers, and by L.A. advocates as a small step towards solving their city's homelessness crisis. The City of Los Angeles, however, disagrees. https://twitter.com/DaleLezon/status/631521843510251520 In South L.A., city officials are seizing "tiny homes" that belong to homeless residents. After the City Council passed a tough "sweeps" ordinance last year, the city was more easily able to categorize the diminutive dwellings as "bulky items" that could be confiscated immediately. Elvis Summers, a formerly homeless L.A. resident who built and donated the houses, removed seven of them in advance of the city's cleanup. Summers had placed the houses on 110 Freeway overpasses for homeless people to use in lieu of tents. In all, he's built and sited 37 homes, with help from $100,000 in donations and a network of volunteers. https://twitter.com/peoplestrustTOR/status/703665135764664320 "It’s not a permanent solution, but nobody is doing anything for shelter right now,” Summers told The Los Angeles Times, adding that the houses should not be destroyed, but returned to him. “They keep just saying we need permanent housing, but it never happens.” The structures, some advocates for the homeless say, are a safer, cheaper alternative to having homeless people camp on sidewalks. Connie Llanos, Mayor Eric Garcetti's spokesperson, says the mayor is intent on getting homeless people into shelters or permanent housing. For its part, the city did not offer alternative accommodations upon seizing the houses. Although housing choice vouchers and supportive SROs are proven solutions for housing the homeless, cities and individuals outside of L.A. are turning to tiny houses to meet demand. Last year, a Nashville pastor built six cheery, 60-square-foot tiny homes for the homeless that are parked next to his church. In Portland, Oregon, 60 people reside in Dignity Village, a community of small private homes made out of mostly recycled materials. 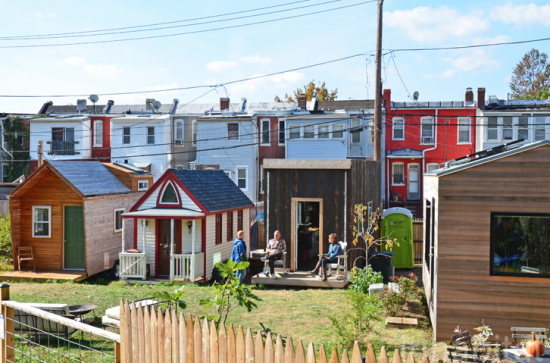 As part of this upcoming April Tiny Homes Summit at the University of Illinois Chicago, the AIA has launched the Tiny Homes Competition. Organized by AIA Chicago, in partnership with Landon Bone Baker Architects, Pride Action Tank, Windy City Times, and a long list of additional local and national advocacy groups, the competition seeks new modular alternatives to affordable and subsidized housing. 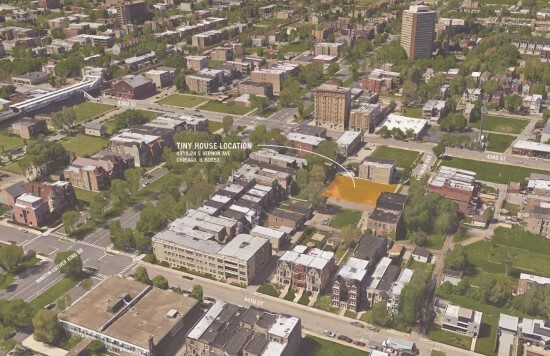 Sited on four conjoined lots in Chicago’s historic Bronzeville neighborhood, the competition also hopes to engage a conversation on Chicago’s large city-owned vacant lot surplus. One module from the winning proposal will be constructed and presented at the spring summit. The competition will specifically address homelessness among young adults between the ages of 18–24, a group that makes up 31 percent of Chicago’s unsheltered homeless population and 19 percent of the sheltered homeless population. Proposals will outline planned 12-unit developments in which residents will have a safe secure space to sleep, study, and store their belonging. The brief also asks for a 1,200 square foot communal space and secure bike storage to be integrated into the overall site plan. 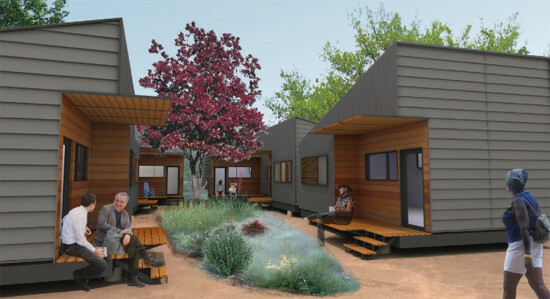 The 350 square foot units themselves will include bathrooms, food storage and prep area, and sleeping area. With a $30,000 limit on material and mechanical systems, teams are being asked to design units that can be produced for under $60,000. The brief also stipulates that the units will follow city building codes, while zoning variances will be obtained to allow for the unique configuration of the projects. Now open, digital presentation boards are due January 30th, with winners being announced in March 2016. Jury members include city officials, architects and advocates. Winners will be awarded $5,000, as well as an additional $5,000 to develop construction drawings. Taking a cue from a program in Houston, Dallas has decided to house 50 homeless people using low-cost cottages designed by bcWORKSHOP, short for Building Community Workshop. The small dwellings are expected to open to residents in late October. Each person will have his or her own 400-square-foot home complete with a compact kitchen, living room, bedroom, and bathroom. The homes also include access to a shared green recreational space as well as "on-site high-quality mental & medical healthcare and social services." Speaking to Dallas News Larry James, president and chief executive of CitySquare (who will also offer job training among other social services) said: “We found out that if we take the 200 most expensive people, the average person in the top 200 is costing taxpayers about $40,000 a year to keep them on the street.” This fits with the statement made by the executive director of Cottages at Hickory Crossing, Keith Ackerman, who told the Huffington Post that the program will reduce these costs to under $13,000 per person, saving the taxpayer an estimated $1.3million. The project has already received an AIA Dallas Design Award. It has taken six years to come to fruition running up a cost of $8.2 million, most of which has largely been fundraised. Meanwhile, the program has asked the public to help by purchasing furniture from Target via their gift registry. The move by Dallas is not new. Similar developments are cropping up across the country in what is becoming a national trend. Cities like Nashville, TN, has its own group of micro houses, part of the so-called "Infinity Village" which houses six homeless people. 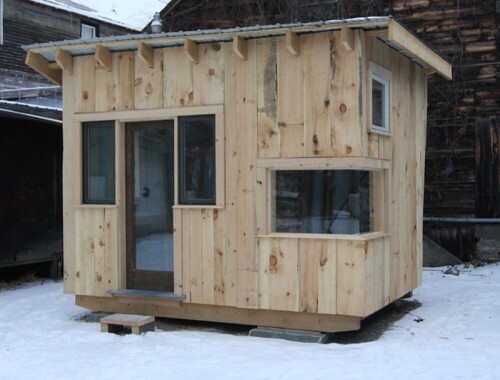 Students enrolled in a sustainable design-build course at Green Mountain College in Poultney, Vermont closed out 2010 by building their own house - a rather tiny house. Covering a mere 96 square feet, the structure cost only $20 a foot for a total price tag well under $2,000. No small feat for a bespoke building, especially considering this tiny house has gone green in a big way. All materials on the house were either reclaimed or locally sourced including two-inch blueboard and locally collected sheep wool insulation. Doors, windows, and woodwork were recycled and salvaged instead of using new materials. The structure has been designed to collect rainwater from its sloping roof and later this year will be outfitted with solar cells allowing for a completely off-grid lifestyle. Later, the house will be put on the market and sold. While living in a sub-100-square-foot space might seem cramped, students incorporated a sloping back wall for a more roomy interior. A student-designed lofted area and interior furnishings help to maximize the small space.